We were blessed with a great sweet potato crop this year and I always try to come up with new ways of using our garden produce. 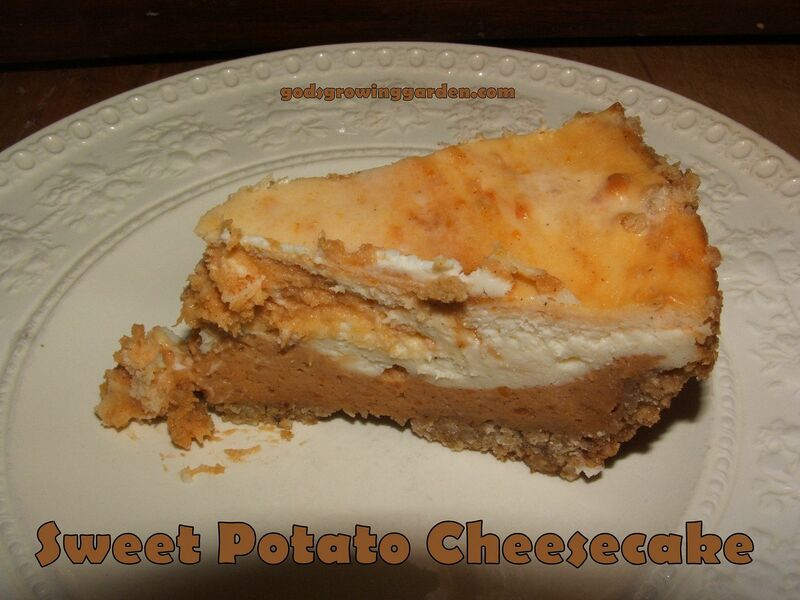 I thought that sweet potatoes and cheesecake make a perfect combination. With an electric mixer, beat the packages of cream cheese, granulated sugar and heavy cream until combined. Add the egg and vanilla and mix until creamy (see picture above). Take out two thirds of this mixture and set aside. To the remaining third of the cream cheese mixture add the sweet potato puree, spices and brown sugar - mix with electric mixer until blended (see picture below on the left). Spread half of the sweet potato mixture on the bottom of the pie crust. Drop dollops of the reserved two thirds cream cheese mixture all over the sweet potato base and then dollop the remainder of the sweet potato mixture (see picture above on the right). With a dull knife, swirl the dollops and smooth the filling (see picture below on the left). Bake in a preheated 375 degree oven for 25 to 30 minutes and then turn off the oven but leave the pie in the oven. Open the door just a bit (make sure the oven has been turned off!) and leave the pie in the oven for one hour. Remove from the oven and refrigerate for 2 hours before serving. Slice and serve topped with fresh whipping cream or cranberry sauce.